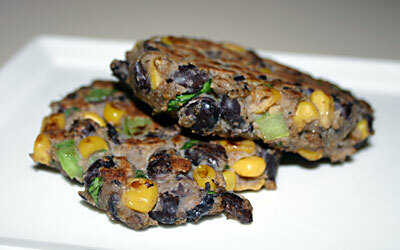 Great Corn & Black Bean Patties That Are Better Than Burgers! Replace egg with vegetarian options like potato starch or another egg substitute. Replace bell pepper with jalapeño pepper to spice it up. Replace regular bread crumbs with panko bread crumbs. 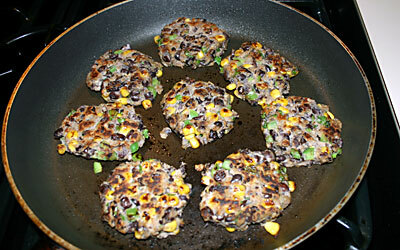 These corn and black bean patties are great as little cakes or as a hamburger substitute. They are simple, nutritious and much better for you than ground beef or crabcakes. They go great with our mango salsa and our guacamole recipes. 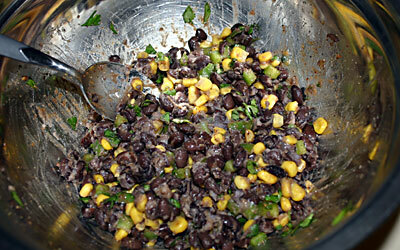 Rinse the black beans until the foam subsides and then put in a medium bowl. Rinse the corn and add 3/4 cup to the bowl. Dice the green bell pepper and add to the bowl. Chop fresh cilantro and add to the bowl. Add the salt, black pepper, granulated garlic and chili powder to the bowl. 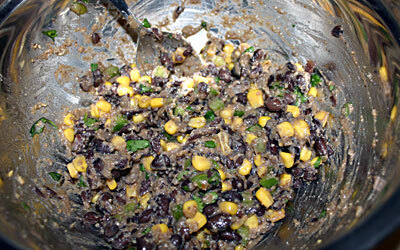 Mix together and then slightly mash the beans and corn to release some of the starch. Add bread crumbs and egg. Mix well. Form into patties (divide into 4 for burgers and 8 for cakes). Lightly grease a large skillet (with oil spray or use regular oil with a paper towel). Heat to med/hi and add patties. 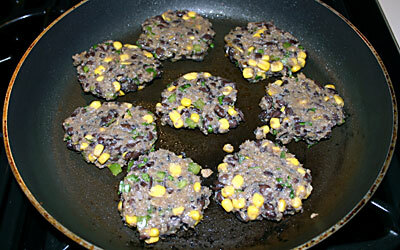 Cook patties 4-5 minutes per side or until lightly browned. Optional: serve the cakes with mango salsa and the burger with guacamole.